It is provided with carbon monotube riggers made with the autoclave. The boat structure is exactly the same of an èlite boat and it is composed by covers and hull, that has got internal shoulders, on which is fixed the carbon load-bearing. 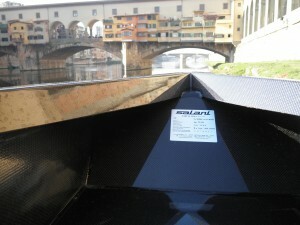 An Elite boat is furnished with anodized aluminium riggers. In the hull are situated the shoulders, on which the aluminium rigger is fixed. Both are made with carbon fibres, Kevlar textiles and epoxy resins. The internal components (ultralight carbon trucks with ball bearing chassis, rowing deck, bulkhead etc) are manufactured using prepregnated carbon, baked in autoclave and cured at 130° C, that assures the best quality available on the market.